The Quiraing on the Isle of Skye has a real mystical and out worldly quality to it. I love making landscape photographs in places that feel a bit different, with an edge. We were treated to 5 minutes of great sunrise light just enough to get a nice image off. Captured on the Isle of Skye at the Quiraing at sunrise. The light was chanagable and the cloud just poured in an out. These beams broke through for a few minutes and I was able to get this shot away. The Glen Etive valley in Glencoe Scotland is a magical place for landscape photography. Big mountains, a beautiful river and lots of old knarled trees. The snow capped mountain in the distance just rounded it all off nicely. A beautiful sunset at Sligachan on Isle of Skye. After downpours of rain the sky lifted and we were graced with some truly wonderful light. A moody evening on Elgol. This dark presentation captures the feel of this eerie and strikingly beautiful location in Scotland. An amazing finish to the day as the sky went on fire after sunset. Stunning Scottish light at its very best. Sometimes the light just demands a simple interpretation of the big view. The Quiraing at sunrise illuminated by beautiful side light is truly a sight every landscape photographer should experience. 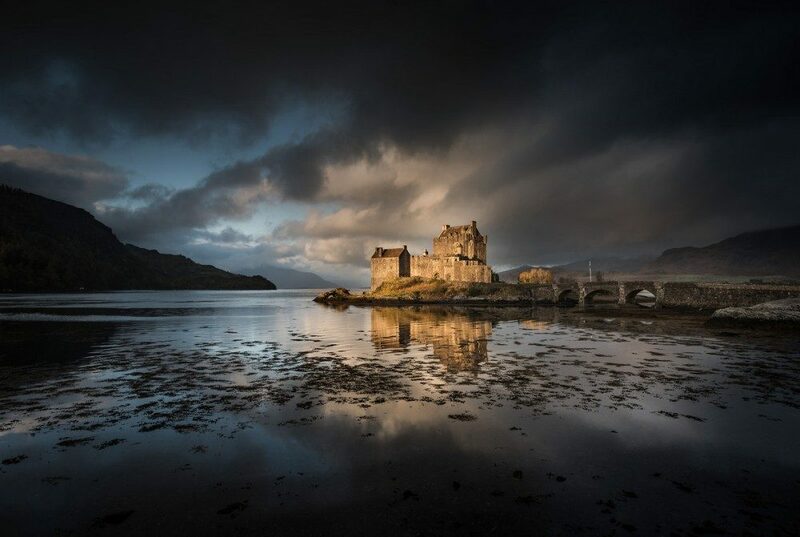 Some uncompromising light just after dawn at Eilean castle Scotland. Im not usually a big fan of castle shots but this one was hard to resist. Perfect stillness in the beautiful village of Plockton. We returned to this tranquility after a sunrise jaunt onto Skye. A single cottage placed amongst the wild untamed beauty of Isle of Skye. Surrounded by a constant flow of clouds somehow this beautiful view in Torridon managed to peak through. An amazing morning of light.. Peak autumns colour in Torridon can feel like another planet. A perfect fresh dusting of snow in Glencoe. It had melted 15 minutes later. A fleeting perfection.